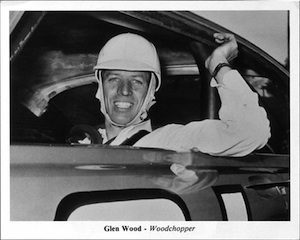 Only those who know just how hard the work is around a sawmill can fully appreciate how much Glen Wood’s early nickname “The Woodchopper” says about him. They know it goes a long way toward explaining how he and the race team he founded went on to win 98 Sprint Cup races and earn the team founder a place in the NASCAR Hall of Fame. Before Wood was a racer, he was a sawmiller. 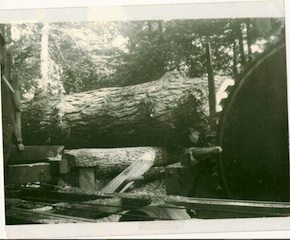 Sawmilling in the 1940s was physically demanding, required long hours and mechanical ability, and involved both physical and financial risks. In other words, it was a lot like running a NASCAR race team. And Wood was good at it. His first sawmill experience came as a teenager, when he hired on to a crew and was assigned the job of carrying the slabs away from the mill. In a typical portable sawmill of Wood’s era, the person running the saw, the sawyer, operated the levers and determined what kinds of boards would be cut from a log. One person stood to his right and helped roll the logs onto the rolling carriage that carried the logs down the track where the spinning blade sliced off a section at a time. The sawyer and helper rotate the logs as the round bark edges, or slabs, were sawed off, leaving a square beam that would then be sliced into lumber. On the other side of the large circular blade would be one person who would “off bear” or remove the freshly sawn board. Another would dispose of the slabs, and still another would operate the edger, a separate device consisting of multiple blades that cut the edges off wide boards, many of which still had bark on the sides. In a modern sawmill, hydraulic lifts move the logs around. In Wood’s day, it was done by hand, with a tool called a “cant hook.” Cant hooks have heavy wooden handles, with a swinging spike at the end. The spike is hooked into the log before turning, but it will easily come loose once the log is turned. Still, great strength is required to roll over a log weighing several hundred pounds. “It was a hard job, especially to turn a big log,” Wood recalled. “How I was big enough to do it, I still don’t know. But I got pretty good at it. He eventually swapped it for a conventional – and more powerful – truck, and continued on with his hauling business until he and his eventual racing partner Chris Williams went into the sawmill business.“We bought the mill and had different people sawing for us,” he said. “One morning we went out to saw, and the sawyer didn’t show up. “I decided: ‘I’ll just see if I can do this.’ I’d been turning logs and running the edger, so I knew enough about it, I thought, even though I’d never attempted to do any sawing. On good days, Wood could saw between 8,000 and 10,000 board feet. (A board foot is the equivalent of a 1-by-12 inch board one foot long.) Production depends largely on the size and quality of the log, the skill of the sawyer and the horsepower at his disposal. Eventually he and Williams sold their mill and Wood went to work sawing for Williams’ brother. By then he was also driving race cars, which made for many a long day and night. He’d be in the woods by daylight to start sawing, then go straight from the woods to a race track and drive a race car that night. “Somebody would bring the car by where I was working, and pick me up and go on to the track where we were racing,” Wood said. Among the many items in the Wood Brothers Museum in Stuart, Va., is an old cant hook, which says as much about Wood and his team’s work ethic as any other piece there. The Woodchopper himself is there most days too, and even at age 86, he’s still strong enough to turn a good sized log if he needed to.